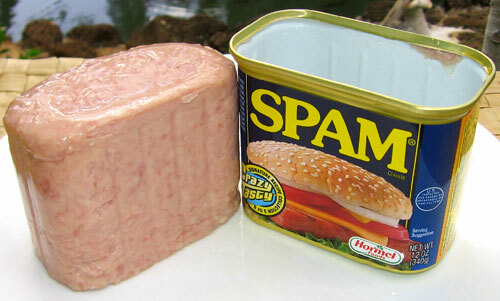 Spam is a precooked meat product in a can. It’s made from pork shoulders, ham, salt, water, potato starch, sugar, and sodium nitrate. It’s ready to eat hot or cold straight from the can. I had it for dinner last night. It was the first time that I’ve ever tried it. I opened the can and let it slowly plop down onto a plate. Then I cut a thin slice and popped it into my mouth. It wasn’t bad. It reminded me of a cold canned Vienna sausage, just a bit more salty. It passed the cold taste test. It wasn’t great but it was certainly edible. I proceeded to cut up a few more pieces of Spam to fry on the stove. I cut some thin slices, a few cubes, and a few thick strips. I cooked them until they were browned and slightly crispy. The cooked Spam tasted more like ham and the thinner slices were reminiscent of bacon. Anything that reminds you of bacon can’t be bad. I still had more than a half can of Spam left, so I threw some in with ramen and made a Spam noodle soup. I also made a bowlful of white rice, added some Spam, and topped it off with soy sauce. The soy sauce was a little overkill because the Spam is already super salty, but it was still a decent meal. I put the little bit of leftover Spam in the fridge until my roommate came home. He never tried Spam before either, so I nuked the rest in the microwave (a serving suggestion recommended by the can itself) and let him try it. The microwaved ham tasted like bland ham, the kind you would find in a Lunchable but heated up. It was better than cold Spam but not as good as fried Spam. All in all Spam lives up to the hype. I can see why Hawaiians are so enamored by it. It’s good by itself, but it’s better as part of a dish. I went thirty years without eating Spam. I don’t think that will happen again. I won’t eat it everyday, but I wouldn’t be surprised if I had Spam once a month or so.